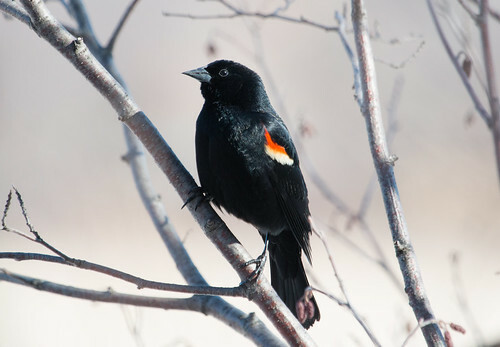 On March 18, 1975, Russ’s and my third wedding anniversary, we headed out for a romantic walk at the Little Red Schoolhouse Nature Center in the Cook County Forest Preserve District, where we came upon the first Red-winged Blackbird I’d ever seen. This was a lifer, not a sign of spring, for me. 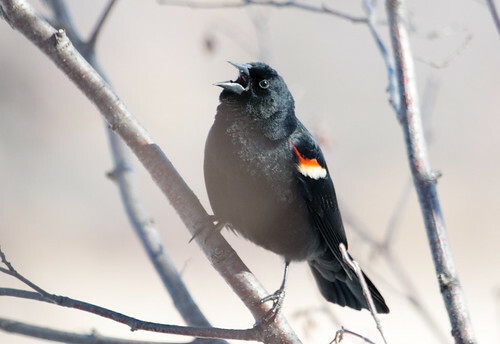 On March 6 the following year, I saw my first Red-winged Blackbird of the year at Point Pelee in Ontario. That was new for my Canada list, but I think the thrill came more from it being back in a marsh—I was still a new birder, but within that first year I could already feel deep within me the difference between a winter marsh and a spring marsh, and the Red-winged Blackbird was at the very heart of that. 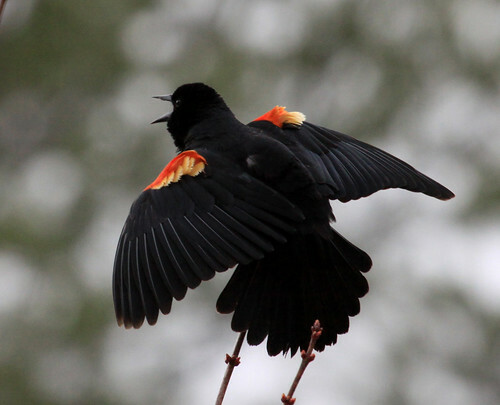 In every one of the 40 springs since then, the first Red-winged Blackbird of the year has given me a surge of joy. This may be one of the most common songbirds in North America, considered a serious agricultural pest, but what does that matter after a long winter when I’m hungry for warmth and evidence that spring really is coming? So this year on March 12 when I led a field trip along the Western Waterfront Trail in Duluth, I turned my hearing aids up a notch so I could be sure to pick out the thrilling O-ka-lee call. A couple of participants picked up the sound before I did, but we all heard some half-hearted songs as well as a few whistles and other notes. The marsh was still mostly frozen, and only three birds had so far returned. One was on the far side of the river, and the two on our side were far apart. Being so far apart gave each the feeling that he controlled an improbably large territory. No nearby birds flaunted their epaulets in his face or sang out, so none of the three had to work at all to defend his vast real estate holdings. Those happy notions would within days be dispelled as more and more male Red-wings arrived to contest their titles to the land, but for now the three felt rich and powerful. It doesn’t matter that I see Red-wings every year, and that in most years I see them at least once in every month. And it doesn’t matter that I’d already seen thousands of Red-wings in California this year. The first Red-wing of spring is a special kind of magic. We perceive the magic partly through our senses—on our field trip, we could feel the warmth of the sun on our faces as we walked about with our jackets unzipped; our eyes could savor the brilliant red epaulets against glossy black plumage; our ears could drink in the sound of voices carried on a soft spring breeze; our noses could sniff out at least a hint of the deliciously wormy fragrance of spring mud and new grass; and our beating heart’s innate sense of rhythm could be reassured as this new encounter fit into the natural rhythmic pattern of so many previous first Red-wings of spring. We know with absolute certainty that we’ll see Red-wings each year, and we know with reasonable certainty that we’ll see our first in March on a day just like March 12 was. From the parking lot before we even started out, most of the participants were already speculating on the high probability that we’d see them on the hike. But that certainty is akin to a child’s certainty that he or she will get a birthday or Christmas present—the certain expectation hardly diminishes the thrilling joy the moment the anticipated present appears in reality. And in the end, that’s what the first Red-wing of spring is: a living, breathing, tangible gift, beautiful in its own right as well as solid proof that the natural world is just as it should be. We can count on it. O-ka-lee and I knew spring was right around the corner. Thank you for sharing..